Did I mention this? I’m a cover girl! That’s my card! This entry was posted in Spellbinders and tagged Cardmaker, Spellbinders. Bookmark the permalink. 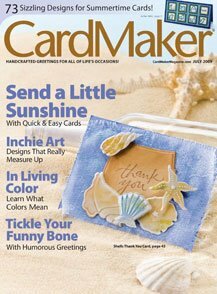 I am happy to visited your site and get some inspiration from this magazine cover.I think you done a great job that's way your card was posted in this magazine on the cover page. Congrats Beth!! Love your card! Can't wait to see you soon!